The Statue of Liberty (French: Statue de la Liberté), officially titled Liberty Enlightening the World (French: La liberté éclairant le monde), is a monument that was presented by the people of France to the United States of America in 1886 to celebrate its centennial. Standing on Liberty Island in New York Harbor, it welcomes visitors, immigrants, and returning Americans traveling by ship. The copper-clad statue, dedicated on October 28, 1886, commemorates the centennial of the signing of the United States Declaration of Independence and was given to the United States by France to represent the friendship between the two countries established during the American Revolution. 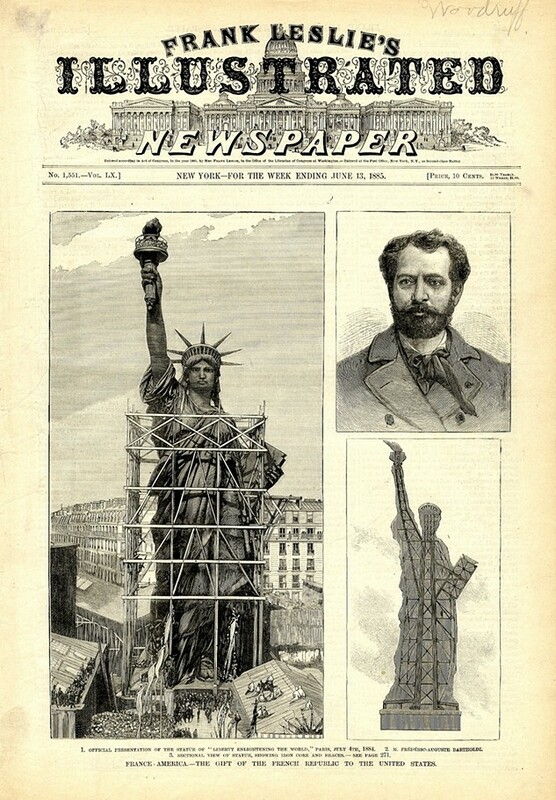 Frédéric Auguste Bartholdi sculpted the statue and obtained a U.S. patent for its structure. Maurice Koechlin—chief engineer of Gustave Eiffel's engineering company and designer of the Eiffel Tower—engineered the internal structure. Eugène Viollet-le-Duc was responsible for the choice of copper in the statue's construction and adoption of the repoussé technique, where a malleable metal is hammered on the reverse side. The statue is of a robed woman holding a torch, and is made of a sheathing of pure copper, hung on a framework of steel (originally puddled iron) with the exception of the flame of the torch, which is coated in gold leaf (originally made of copper and later altered to hold glass panes). It stands atop a rectangular stonework pedestal with a foundation in the shape of an irregular eleven-pointed star. The statue is 151 ft (46 m) tall, but with the pedestal and foundation, it is 305 ft (93 m) tall. Worldwide, the Statue of Liberty is one of the most recognizable icons of the United States and was, from 1886 until the jet age, often one of the first glimpses of the United States for millions of immigrants after ocean voyages from Europe. Visually, the Statue of Liberty appears to draw inspiration from il Sancarlone or the Colossus of Rhodes. 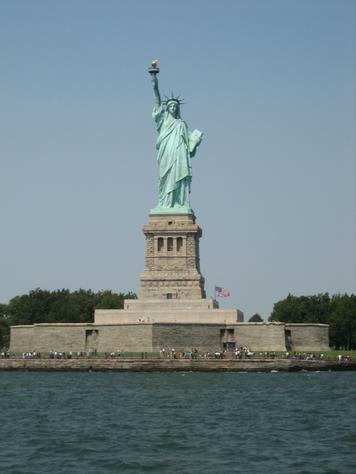 The statue is the central part of Statue of Liberty National Monument, administered by the National Park Service.